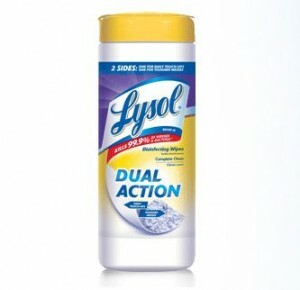 We are getting geared up for Spring cleaning and right now is the time to try Lysol Dual Action Wipes! Purchase them from your favorite store and then send in this Lysol Dual Action Wipes Mail-In Rebate to get your cost reimbursed, up to $5. These wipes are great for cleaning up after your little ones or for quick cleaning in the kitchen or bathroom! Two things to note: you can buy either the 35 ct. or 75 ct. canister, but it must be a single pack. Your Lysol wipes must be purchased by April 30th and your rebate must be postmarked by June 30th. Check out more Rebate Deals!